With an impending snow/ice storm in the forecast my dad took us to the airport. He and Steve guided two luggage carts through the hour-long line at ticketing while I kept Bowen busy. I'm sure Dulles main terminal's architect Eero Saarinen (a Finn, but it sounds Swedish!) didn't intend for his concrete columns and heating grates to be used as a play area, they proved to be durable and interesting to our kids. Sidebar: I have talked before about traveling with kids, and I want to clarify something about that. I love my kids. I love to travel. That does not mean I love to travel with our kids. And that does not mean I will never love to travel with our kids. I have come across a couple of key books on the subject, and one of them (Thanks, Mary!) validated my feelings when it specifies that their book was written about traveling with kids who are at least 6 years old, i.e. can carry a suitcase, not wet the bed, and don't need naps. I do look forward to adventures with our kids when they're school-aged. Back to our journey to Sweden with a 2- and 5-year old... Even after checking our biggest bags we looked like pack mules. Two rollers, a duffel stuffed with coats and last-minute "don't leave me" items, two backpacks, a messenger bag, my purse, two kids, and a carseat. You should have seen us snaking through the line at security, no longer with the benefit of another grownup and two luggage carts. By this time Bowen was super cranky (didn't get his nap, wanted to Run! Free!) 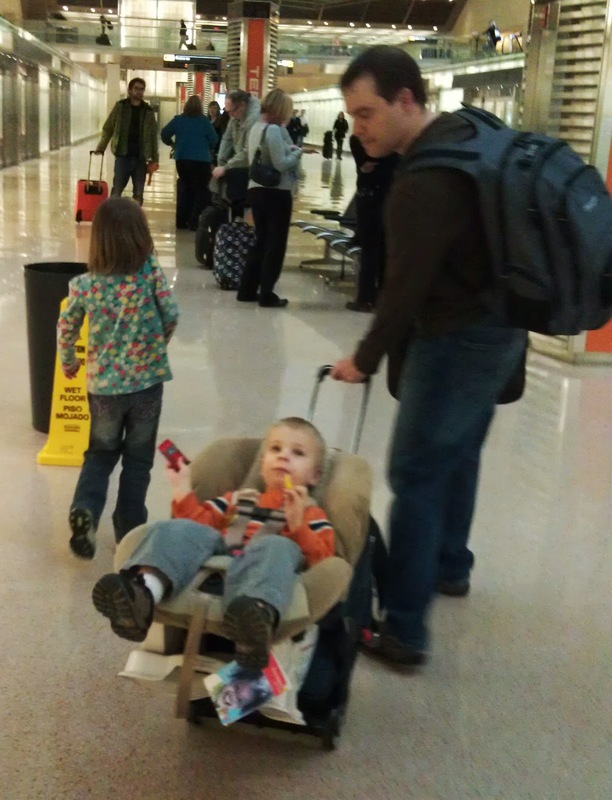 Once we finally got all of our items and children through security we deployed this handy tool that allows you to strap a carseat to a rolling suitcase. This was extra important because the movers accidentally put our stroller in storage on Thursday. Once Bowen was strapped in and riding backwards, two things happened: 1) He was happy again, and 2) strangers in three airports were staring at Steve pulling Bowen as if they were celebrities. Even gate crew had never seen this before, so I'm writing to you now to tell you to get one if you need to fly with a toddler in a carseat. One of the few advantages to flying with little guys is being able to pre-board the plane. We were able to get settled with the things we'd need for the long-haul flight before the masses boarded, and the plane was full. As our departure time came and went, the captain let us know he was waiting for a few passengers who were connecting from other flights, and we would make up the time in the air. By the time they boarded it was getting a little stuffy in the cabin, and then we were told there had been a problem with the air conditioning. Finally we we pushed back, only to taxi out and wait in line to take off. Meanwhile I had pulled out a water pen book and Bowen sat and colored for a couple of hours. As the pages get wet the design is revealed, and by the time he worked through several pages the first one had evaporated and he'd start over. I had bought this for the plane ride, remembering how our friend Pam had gotten one for Olivia (who was about the same age) when Bowen was born. It's one of those simple-yet-captivating toys that doesn't make a mess, yet I rarely see them, so this is my little advertisement for all the moms who need a little quiet time. A mini-Etch-A-Sketch was the magical toy that kept Olivia busy. 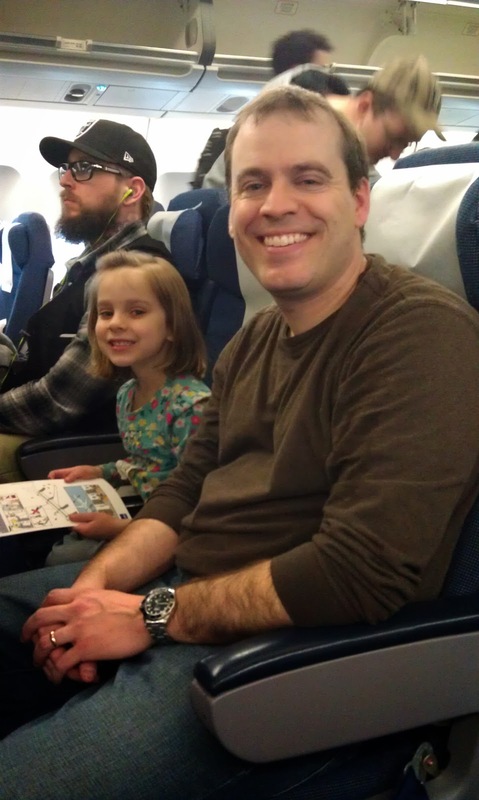 Once we were airborne Olivia was thrilled to watch Frozen again on her seatback monitor. (All the overseas planes seem to have this feature - a huge improvement over craning your neck to see an overhead screen.) Dinner was pot roast with mashed potatoes, supporting my opinion that airplane food is quite good. Maybe it's just that by the time dinner is served you're so hungry that anything tastes delicious. After dinner they thankfully dimmed the cabin lights and our kids dropped off to sleep. Bowen did wake up disoriented and upset a little while later, but I held him for a while and then plunked him back in his seat and he slept for the rest of the flight. He even slept through breakfast, so I saved that for later. When I've taken an overnight flight before, my goal is to sleep as much as possible so I don't lose a night of sleep. I have even taken a sleep aid and tried to fall asleep right away, only to be interrupted by the flight attendants constantly offering refreshment. This time I dozed when I could, not expecting to get any real sleep, and when we landed I was kinda tired but didn't have that groggy feeling I usually get from the medicine. We did land on time and connected smoothly in Copenhagen. I was thankful that we didn't have to claim+recheck our big bags there (because sometimes we do; I just can't remember when). We were able to pre-board the next plane, and that flight was only 30 minutes to Gothenburg. By the time we got off the plane and to baggage claim the only things left on the carousel were our bags and Olivia's 2-part booster seat. 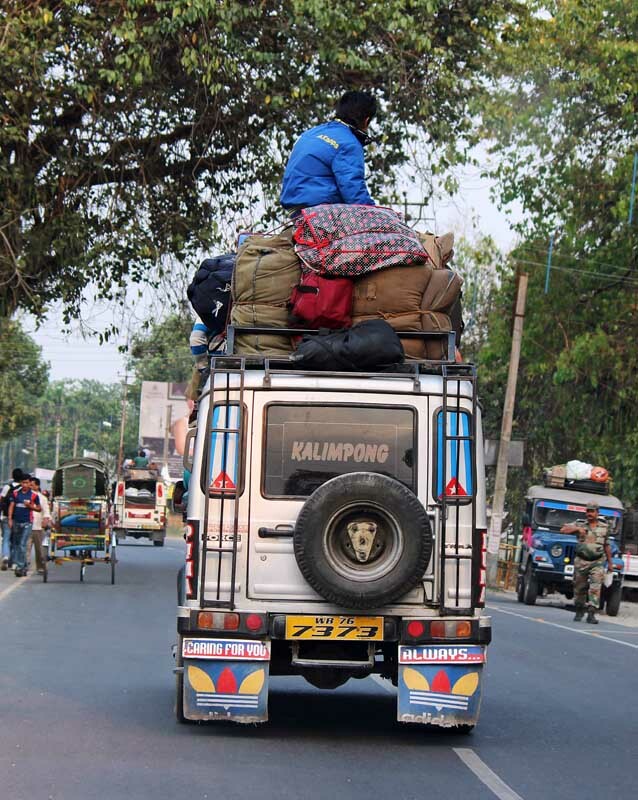 Outside there was a taxi available to accommodate our baggage, although it may have looked a little like this. Throughout our trip it occurred to me that so many things could have gone wrong but didn't, even the snowstorm that happened just after we left. I am so thankful for all the friends back home who were praying. I expected it to be a dark day in the history of my life, but even with all the baggage-schlepping and toddler-wrangling it was nothing compared to labor. 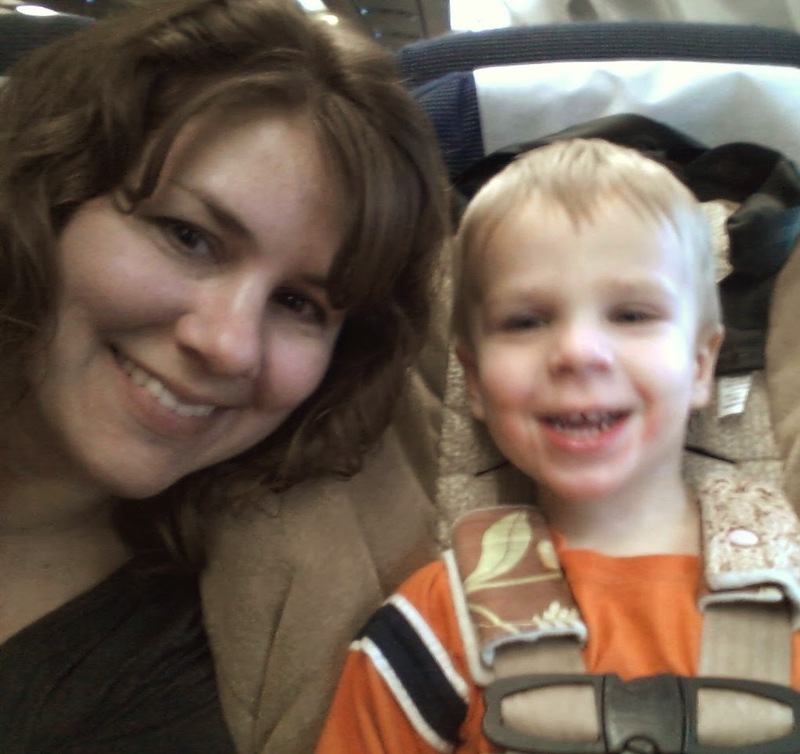 Travel with toddlers! It's easier than giving birth! It'll be great! Ahem.